After a complimentary consultation, measurements and notes are taken of your landscape, your pool and landscape design consultant will work with you to create a digital 3D image of every feature and detail, taking available space, terrain, sun exposure, budget and safety needs into account. Once plans and budget are agreed upon, the Unique team will work with the county to get your building permits approved. 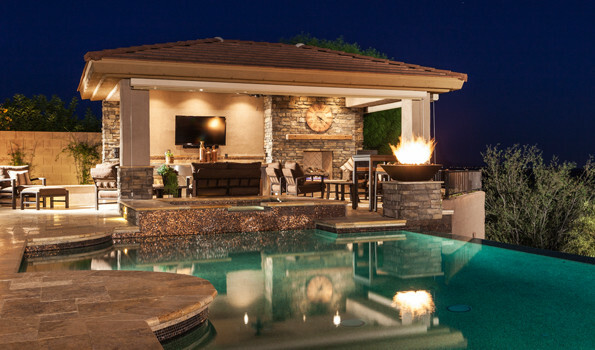 Unique Landscapes and Custom Pools works with only the highest quality materials. Careful attention is paid to safety and precision in each step of the pool and landscape construction process. You are able to follow along with the process through an online schedule, and your designer is always available to answer your questions. Once our crew’s show up to start work, the same crew stays on the project until it is finished! This may sound simple and ordinary, but many of our competitors use different crews to juggle their projects and schedules around, and end up dragging out a project for much longer time than it should have taken. Our crews are very experienced and have a knowledge and skill set to complete any project with the quality and standards we have set as a company. After building thousands of pools and landscapes, our construction teams have quite literally done it all – with a commitment to quality and safety. Interpretation of the design is extremely critical to how your project takes form. Our designer maintains communication with you and the project foreman throughout the entire construction process. Daily inspections by the designer, and constant communication company-wide are critical components to every project, and this is what gives a small company like us a huge advantage in our industry. Every employee’s focus is on each project and our customer’s satisfaction.